Gay Men To That!! : Did Anti Gay Marriage Pastor Matt Prater Change His Bio To "Hide" His Divorce? 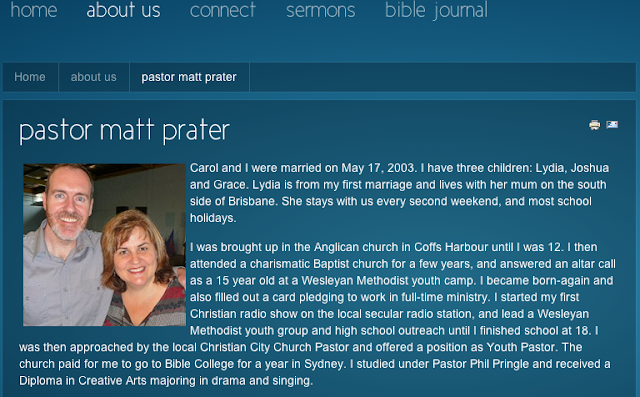 Did Anti Gay Marriage Pastor Matt Prater Change His Bio To "Hide" His Divorce? 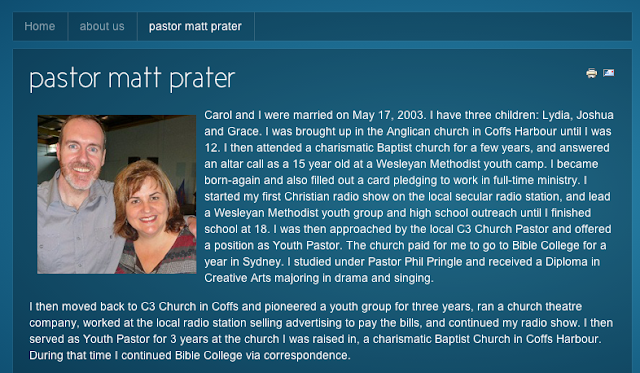 Australian Prime Minister Kevin Rudd made minced meat of Pastor Matt Prater by pointing out his biblical hypocrisy. It now seems that Pastor Prater is trying to minimize the fact that he is divorced and remarried. Here is a screen shot of a cached version of the site from August 27th, 2013. "Carol and I were married on May 17, 2003. I have three children: Lydia, Joshua and Grace. Lydia is from my first marriage and lives with her mum on the south side of Brisbane. She stays with us every second weekend, and most school holidays." "Carol and I were married on May 17, 2003. I have three children: Lydia, Joshua and Grace." Where did the reference to his first marriage go? Why was this changed? The timing is interesting, to say the least!